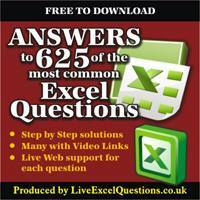 ” Answers to 625 of the most Common Excel Questions” is a comprehensive Excel Solution book , with hundreds of formulas you can adapt and customize for your own use. It covers all areas of Excel. Every student who attends one of our public courses or purchases our online course, will receive a free copy of this valuable reference guide.